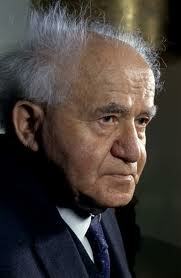 David Ben-Gurion (Hebrew: דָּוִד בֶּן-גּוּרִיּוֹן‎, born David Gr�en) was the first Prime Minister of Israel. Ben-Gurion's passion for Zionism, which began early in life, led him to become a major Zionist leader and Executive Head of the World Zionist Organization in 1946. As head of the Jewish Agency for Palestine, and later president of the Jewish Agency Executive, he became the de facto leader of the Jewish community in Palestine, and largely led the struggle for an independent Jewish state in Palestine. On 14 May 1948, he formally proclaimed the establishment of the State of Israel, and was the first to sign the Israeli Declaration of Independence. Ben-Gurion led the provisional government of Israel during the 1948 Arab-Israeli War, and united the various Jewish militias into the Israel Defense Forces (IDF). Following the war, Ben-Gurion served as Israel's first Prime Minister. As Prime Minister, he helped build the state institutions, presiding over various national projects aimed at the development of the country. He also oversaw the absorption of vast numbers of Jews from all over the world. A centerpiece of his foreign policy was improving relationships with the West Germans. He worked very well with Konrad Adenauer's government in Bonn and West Germany provided large sums in compensation for Germany's mistreatment of Jews in the Reparations Agreement between Israel and West Germany. In 1954, he resigned and served as Defense Minister, before returning to office in 1955. Under his leadership, Israel responded aggressively to Arab guerilla attacks, and in 1956, invaded Egypt along with British and French forces after Egypt nationalized the Suez Canal.